After winning two consecutive Grand Slams at the age of 21 and achieving the rank of world No. 1, Japan’s Naomi Osaka leads the generation of stars poised to break out in the twilight of Serena Williams’ career. However, despite her recent successes, Naomi Osaka fired her coach and hitting partner Sascha Bajin for reasons not made public. The announcement followed a triumphant Australian Open in January and an unmistakable change in Osaka and Bajin’s relationship, as Osaka practiced multiple times without Bajin during the Australian Open and sessions with Bajin failed to last more than ten minutes. Even more telling was Osaka’s post-championship Instagram post after defeating Petra Kvitova in the Australian Open finals, a customary ritual usually saturated with appreciations and gratitude from the champion. Osaka wrote in reference to Bajin, “…Thank you Sash for hitting with me these past two weeks.” By relegating Bajin to the role of hitting partner, Osaka was denying and diminishing Bajin’s role as her coach. Notably, Osaka’s appreciation for Bajin was only that one sentence hidden amidst more effusive praise, peppered with emojis and inside jokes, dedicated to the rest of her team. Finally, in an interview after the final with Kvitova, Osaka said, “Yeah, no, we haven’t really been talking, to be honest, before any of my matches here. He would tell me one thing; then I would be, like, OK. That was it.” It is clear that Bajin and Osaka’s relationship was strained. If so, Osaka’s run through the Australian Open draw is even more impressive; to defeat five seeded players with different game styles without extensive coaching is a remarkable feat. Speculation is rampant regarding the reasons behind the split after such a successful and fruitful partnership. Jon Wertheim of Sports Illustrated wonders if the split was simply a reflection of the trend of the WTA and sports as a whole. Coaches are seen less as permanent mainstays or as partners but rather as sources of finite knowledge from which to extract all that one can before moving on. Bajin, the longtime hitting partner of Osaka’s idol Serena Williams, started working with Osaka in the lead-up to the 2018 season, when she was ranked 68th in the world. The job with Osaka represented a huge career jump for Bajin, as Bajin had never served in a head coaching capacity previously. Immediately, the duo found success, winning the BNP Paribas Open in Indian Wells, a WTA Premier Mandatory tournament, the level immediately below a Grand Slam, and then defeating Serena Williams in Miami the following week. Under Bajin, Osaka defeated Serena twice, won two Grand Slams, and rose all the way to No. 1 in the world. Bajin also earned himself a Coach of the Year award in 2018 to accompany Osaka’s title spree. Regardless, futures are bright for both Bajin and Osaka. On the tour, while the turnover rate has risen recently among coaches, the coaching pool itself remains more or less constant, and Bajin is likely to be hired within the year, especially after experiencing such rapid success with Osaka and earning a Coach of the Year award. It’s difficult to gauge the impact of a coach, and while Osaka did excel after hiring Bajin, it’s impossible to know whether her breakthrough was motivated by Bajin or if she would have developed as such regardless. Clearly, Osaka believes the latter. By March, Osaka is expected to have a new coach. 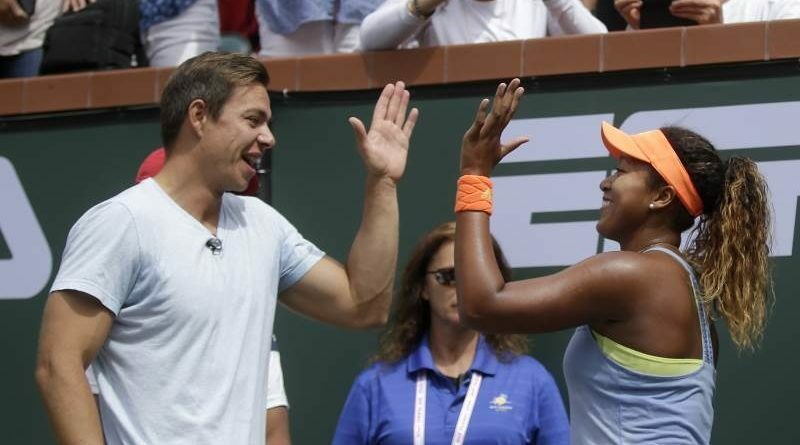 As she recently stated, “It’s not really ideal to go to Indian Wells without a coach.” Results in March at Indian Wells and over the clay court season in Europe in the summer will provide a litmus test for Osaka’s decision. However, Osaka’s talent is undeniable, and she projects to have an incredibly successful career with or without Bajin.